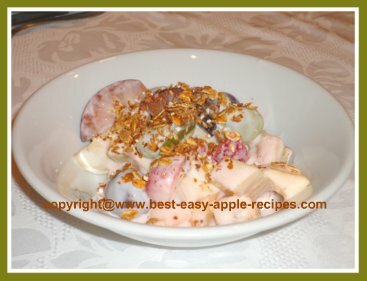 Make this Low Fat Breakfast Fruit Salad Recipe to start your day! A yummy salad with mixed fruit, a dollop of yogurt, and a sprinkling of granola on top, makes a healthy breakfast or brunch with fruit. The granola topping can be any type of cereal you have on hand. A great recipe idea for a Bed and Breakfast! Enjoying a fruit salad for breakfast or brunch is a fabulous idea ... everyone loves the taste of fresh fruit! Beginning the day with fruit is a healthy choice, and serves to provide you and your family with much of the daily requirement of fruit (and fiber!) . This is a very quick and easy salad recipe to make. It can be made in advance, for example, the night before, so as to have it ready to go for the morning breakfast. If you are preparing this fruit salad the evening before the day in which you plan to use it, combine only the prepared fruit. Add the yogurt and the granola just prior to serving the fruit for breakfast. This will help to keep the fruit fresh, and the granola crisp! You can easily substitute different fruits, or more or less of a favourite fruit, or fruits that are ripe locally. *If desired, toss the chopped apples in ascorbic acid colour keeper or lemon (citrus) juice to prevent discoloration. In a large bowl, combine the prepared apples, nectarines or peaches, raspberries, strawberries, blueberries, green grapes, and the red grapes. Gently, so as not to crush the fruit too much, stir in the yogurt. Sprinkle the granola, and then the nuts, over top of the fruit salad. Spoon the fruit salad into individual serving dishes, or allow family or guests, to serve themselves from the large bowl of salad. A good choice for a breakfast salad to accompany breakfast muffins, bagels or pastries too!